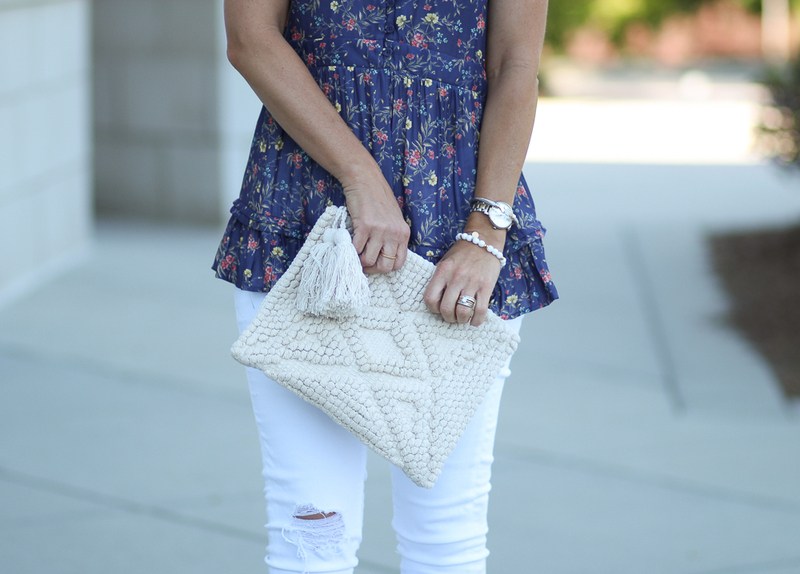 A sweet tank that mixes floral, ruffles and a peplum. It'll work for any occasion this Summer...with jean shorts running errands or jeans and heels for a night out! 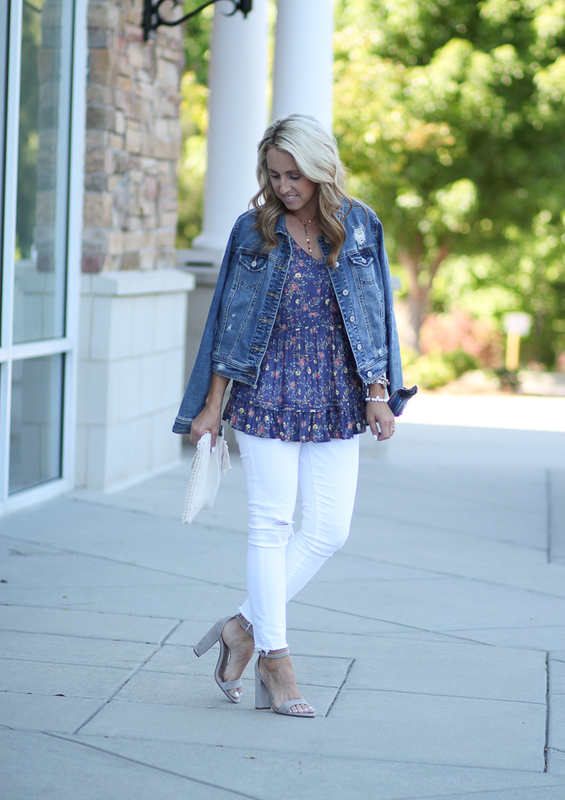 My peplum loving heart is happy because I found another beauty to share with you! This one is floral and perfect for Summer. Of course I paired it with white jeans, but it'll be so cute with shorts too when the temps get hot. If floral isn't your thing, it also comes in an ivory. In the Winter I always reach for a warm and cozy cardigan when it's chilly. But in the Spring and Summer, I love my jean jacket. Probably because it looks so good with white jeans and I have been wearing white jeans almost daily!! And ladies, these white jeans are the best. They are cropped with a distressed hem, 1 distressed knee and they are under $65! To find these search under Podcasts or in iTunes on your phone, ipad or computer. I love this one! It's about entrepreneurs and the companies/movements they started - some of the biggest and best companies and brands. The stories are told by the founders themselves and the interviewer, Guy Raz, is so good. Each episode is about 30-45 min. long, so perfect for in the car or while walking the dog. 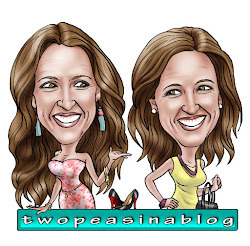 Two of my recent favorite episodes are Kate Spade and Angie's List. One that is newly released, but I haven't had a chance to listen to yet, is Lady Gaga!! This podcast covers design that is all around us, that we have stopped noticing. Things that just blend into our surroundings or things we see everyday that we just become accustomed to. These episodes are shorter, usually less than 30 min. Yes, this is a sports podcast from ESPN, but it is so entertaining. They do talk sports but in a lighthearted way and they mix in some pop culture. And they are both so funny. My husband and I listen to this every night in bed as we fall asleep. Even when my husband is out of town, I still listen to it!! And we've gotten our son hooked on it! If you have any podcasts that you are currently loving, let me know in the comments. This outfit is adorable! I've been looking for another pair of good white jeans so I will have to check these out. What a fun top! I love the flowy fit! This is such a beautiful springtime outfit on you! I absolutely love the ditsy floral pattern and the fun ruffly peplum hem. It's super flattering and you're right, it can be worn so many different ways. Those are the best kind of pieces, aren't they?? I'm excited to try out these podcasts. I only recently got into listening to them and I've been looking for more, so this was perfect timing! this floral print is so pretty and i love your white clutch! I love "How I Built This" too, very empowering song for young entrepreneurs like ourselves! You look great btw, love the outfit! Such a pretty peplum top, and I love it with the white jeans! I just listened to my first podcast the other day! I'm a huge fan of jean jacket too. It's been perfect for the cold spring weather. I love this look! Im going to see if they have these jeans at my store, I'd love a distressed pair. I've been listening to a true crime podcast called CaseFile True Crime. Some of them I've seen profiled on various different shows, so I love that the podcast has all of the behind the scenes info.